This is a podcast for the real hoopheads who grow bored with discussing the same rhetoric over and over. Here at the 94, we bring a fresh outlook to the game that occasionally challenges the narrative. Our 4 guard rotation...Big Shot Ron, Jay Hamm, M Drop The J Cause The Fadeaway Perfect (MJ for short) and Trav breaks down the game and explains the “why” behind the things that occur. We don’t just talk either, we break down film, stats, our vantage point, and our guests perspective. Make sure you check out www.94feetoflife.com to hear our previous shows. We got receipts! The Chicago Bulls went through some interesting measures to express how they feel. MJ and Trav gives the 101 to pimpin and related it to the situation, the NBA, your job...every damn thing. NBA is back...and So are we! Trade deadline discussion...Cavs traded away half their active roster...oh an other deals were done too. Tune in! Epic battle between Curry and Irving leads to us speaking more about the PG position. Got Trav and Big Shot on the line with MJ and we discuss. Tune in. Big Shot and MJ go in for a quick 5 minutes on why we felt Trae Young played a perfect game against Kansas. We are nothing more than humble guys who like to talk hoops. Every now and then, we get into debates where it becomes something a little more. MJ and Trav breaks down why we do this and reintroduces 94 Feet of Life. 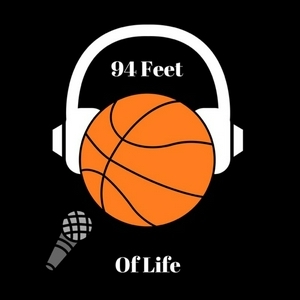 Check us out at www.94feetoflife.com Basketball for the People...by the people. 94 Feet explains why a democratic approach to the offensive systems in the NBA could possibly lead to the increase of ridicule for guys who dominate and stop the ball. Tune in and let us break it down. Check out the website at www.94feetoflife.com Basketball for the People...By the people! Sponsored by Ball U Academy and Hamms Cookies. Trav and MJ presents the 94 Feet Of Life Baller Of The Night, sponsored by Ball U Academy and Hamm’s Cookies. As we present it to the masses, we can’t help but explain to you the importance of the PG position and why True Point Guards matter. Check out the website, www.94feetoflife.com. Basketball for the People...by the People. MJ and Big Shot Ron sneak away from the 9-5 to share our thoughts on the Ball family and their decision to take the road less traveled. Make sure you log into www.94feetoflife.com for more coverage on this game we love. MJ taking the time to put y’all up on game. Log into www.94feetoflife.com to check out the debate of the week. The usual suspects are back bringing that heat...just press play.